Our pavlova by The Happy Pear is the perfect vegan dessert to top off an amazing Easter Sunday feast! Preheat oven to 130C degrees. To make the meringue, add the chickpea water to a clean bowl and whisk using an electric mixer or a stand mixer, using the whisk attachment. Whisk for 6-8 minutes on a medium to high speed until it starts to whiten and firm into stiff peaks, slowing the speed and add the sugar slowly in stages, increasing the speed in between adding the sugar, when all the sugar is added whisk on medium speed for 3 minutes. The meringue is ready when a peak stays standing firm on the whisk attachments once you remove it. You’re looking for stiff peaks. While the pavlova is baking, with a spoon remove the cream/fat at the top of the tin of coconut milk and transfer to a bowl. Add the coconut yogurt, maple syrup and the vanilla extract. Mix it all together for a minute or two until it becomes uniform and homogeneous in terms of texture and look. When the pavlovas are baked, turn off the oven and allow the pavlovas to cool and dry out further in the oven. We usually make them single layer pavlovas but if you are confident enough to make a double layer go for it, just ensure that your pavlovas are light and strong. 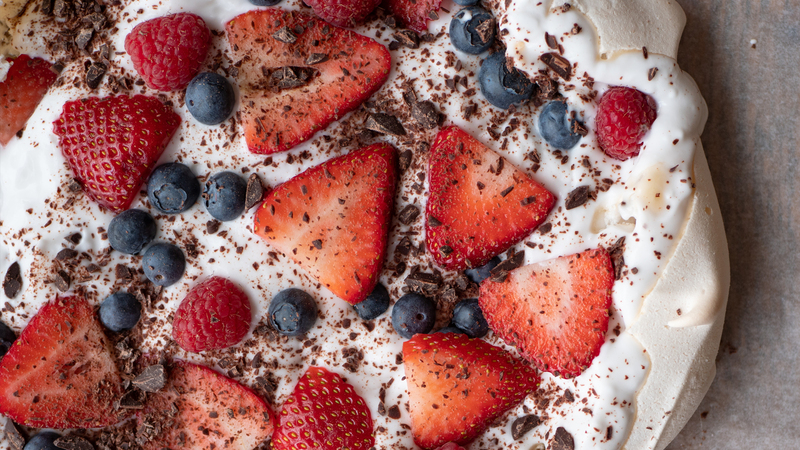 When they have cooled, spread the coconut cream/yogurt over the pavlova and scatter with berries. We like to add some finely chopped chocolate shards and even a couple of fresh mint leaves too, serve and enjoy.